The 80 foot ELCO PT Boats were an improved and enlarged version of the 77 foot boats. Longer and wider with an initial upgraded armament of one 20mm Oerlikon cannon on the deck aft of the engine room cabin, the first 80 foot boats, the PT 103 class (PT 103 – 196) were launched in 1942. The first 80 foot boats were assigned to squadrons operating in the South Pacific, RON 5 (PT 103 – 114), RON 6 (PT 115 – 126; PT187, 188), RON 7 (PT 127 – 138) and the training squadron (RON 4) at Melville (PT 139 – 141). These boats were often field modified with additional cannons and depth charges as the conditions changes and targets worthy of torpedos became less frequent, and the PT Boats were increasingly used to interdict barge and transport traffic resupplying and reinforcing Japanese troops on the islands. The most famous of the early ELCO 80 foot boats was the PT 109 commanded by Lt. John F. Kennedy. At the time of her sinking, the 109 carried an Army 37 mm field anti tank cannon on the foredeck. 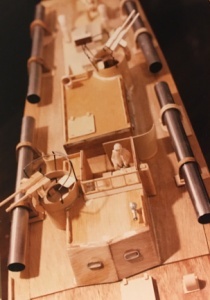 With wheels removed, the gun was lashed to timbers as an experiment to see if the heavier gun would be more effective against the armored barges. 109 also carried one or two depth charges on roll off racks also on the foredeck, just forward of the cabin. PT boats used depth charges when running from enemy destroyers as means to slow or divert pursuit. My first PT model was built from the Dumas kit of the 109. While kit-bashing that model, using plans by Al Ross, Jr., I got interested in building more PT models, and built a second version of the 109 using the scratch building techniques developed for the PT 34, a 77 foot ELCO. The following photos are of the Dumas kit as it was modified. The details, including guns, were carved from maple or basswood. The torpedo tubes were made up from 1/2″ stainless steel water pipe found at the local (Riyadh) hardware store. 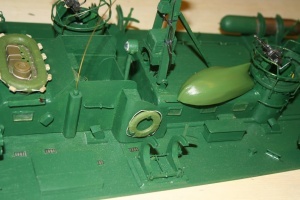 The detail was satisfactory for a stand-off model, and the boat performed will with a 540 motor and single oversize prop, but I wanted to build a more detailed and “correct” version. See below. 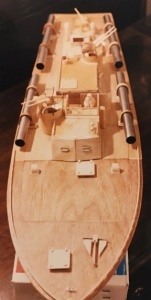 The second model of the PT 109 was in 1:32 scale and built of double planked balsa over plywood bulkheads, as for the PT 34, 77 foot ELCO model in the same scale. The boat was detailed using the plans by Al Ross from Coastal Forces. Following are some photos of the second boat in the pond of the Diplomatic Quarter in Riyadh, together with the PT 34. They made nice companion models and both were later donated to the PT Boat Museum in Fall River, MA. 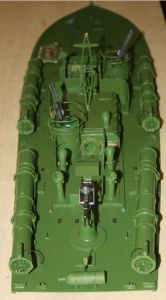 PT 109 model sometime in 1987. Note the depth charge in the rack on the foredeck, a field modification by the crew. On her last mission, she also carried a US Army 37 mm anti-tank cannon, wheels removed and lashed to two large bamboo planks on the foredeck. When the boat was rammed, one of the planks broke free, and it was this plank the surviving crew used to cling to when swimming to a nearby island after the bow fragment of the boat was sinking. The two models together, showing the differences between the 77 foot and 80 foot ELCO boats. In 2015, I began a series of PT models, all in 1:32 scale, using plans from Coastal Forces. I built three hulls (ELCO 77, ELCO 80, and Higgins 78) and two decks for each. 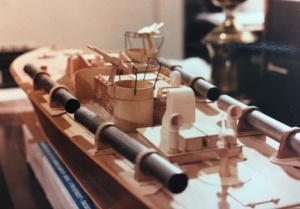 One deck was for an early version of the particular boat (with torpedo tubes) and one for a later version, with roll off torpedoes and enhanced armament. This is a snapshot of the three hulls under construction. 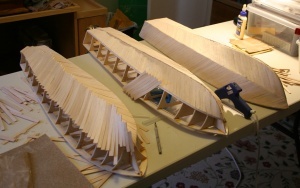 The bulkheads are of 1/8 plywood with balsa chines and planking of two layers of diagonal 1/16 balsa with nylon stocking and glue between the layers. I added some additional bulkheads and also cut out much of the center of most of them to provide more room for running gear. 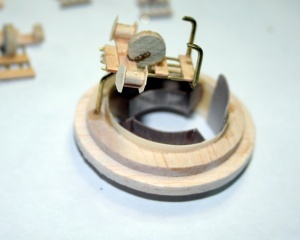 I also glued them to a plywood edge board, to which the deck would be later fastened, rather than to the entire deck as I had done with the earlier models. 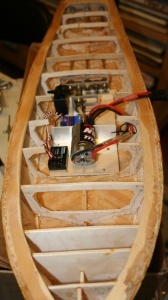 This shot shows the interior of one of the hulls with prop shafts installed. The three props are driven by a single motor, using the Dumas propulsion gear system. All the boats were built using this system. The flat area forward of the gearbox is for mounting the motor, receiver, speed controller, and rudder serve which, as a unit, can be switched between the three hulls. Here is the power/control unit installed in one of the hull. Using the Dumas gearing system allowed me to accommodate the variation in spacing and angle of the prop shafts in the three hulls. Using a control/power unit that swapped among the hulls saved duplication of motor, ESC, servo, and receiver. Another shot of the powered up hull. 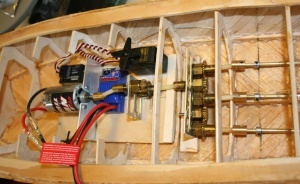 The battery for the motor was installed in a small box built atop the gearbox and propeller shafts, with the position of the box adjusted forward and aft so the boat floated properly along the waterline. 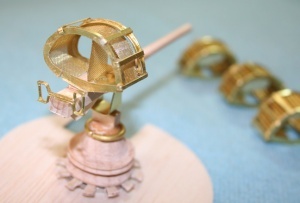 Following are some snaps of various components of the boats under construction. 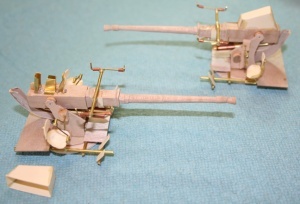 These are the machine guns under construction. The guns are mounted on similar carriages but the turrets differ. Shown are guns for the early 77 foot ELCO on the left, the late 77 foot ELCO in the middle (including guns on pedestal mounts for a “barge buster”) and guns for 80 foot ELCO on the right. Higgins mounts were similar to the 80 foot ELCO. This is a snapshot of the cradle, ammunition feed, ammo cans, and turret top for ELCO PT. 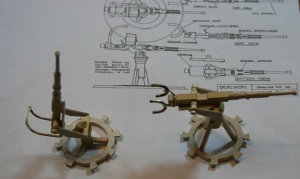 Some 20 mm Oerlikon cannon under construction. The early and late 80 foot ELCO boats carried one of these. Mid and late Higgins boats carried one or two. 37 mm auto cannon. Crews in the field stripped some of these guns from damaged P39 Aircobra aircraft and installed them on PT boats. By late 1943, a Naval version of these guns was being supplied on PT boats, both the late 80 foot ELCO and the Higgins boats. These guns were sometimes referred to as “Oldsmobile Guns” because of the manufacturer. 40 mm Bofors cannon under construction. 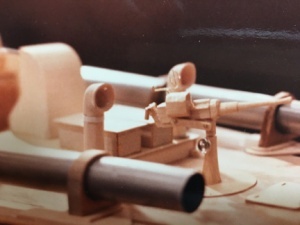 In the field, two of these guns were mounted on three late 77 foot ELCO boats (PT 59, 60, 61) as “barge busters” and the experiment was so successful that by the end of the war, one 40 mm cannon on the after deck was standard equipment on late ELCO 80 and Higgins PT Boats. Here is a picture of the deck for the early ELCO 80 foot Boats. (PT 103 class) This version had 4 torpedo tubes, a 20 mm cannon aft, the standard twin 50 caliber machine guns in turrets and no radar. When radar became available in late 1943, most of the boats were retro-fitted with the new device. Crews in the field also experimented with upgraded armament. 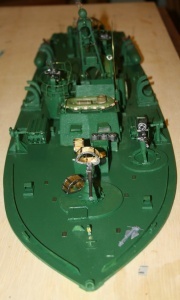 One squadron in the Solomons, RON 9 converted the forward turret to mount two 20mm Oerlikon cannon. PT 157, the PT which patrolled with the PT 109 and later rescued Kennedy and the surviving crew was a member of that squadron and was so modified. There is an excellent builder’s notebook about modeling the 157 by Bridgeman Carney available from Amazon. 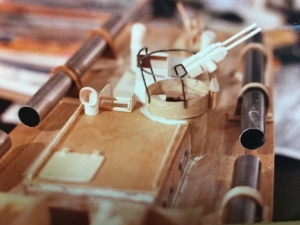 Another shot of the deck of the early ELCO 80 class, showing the 20 mm cannon on the after deck and the smoke generator on the stern. 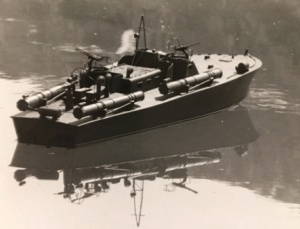 By the late stages of the war, PT Boats were gun boats rather than torpedo boats, as their primary mission had changed from attacking capital ships to operating in more shallow waters against smaller craft, not worthy of a torpedo. With the elimination of the weight of the torpedo tubes by converting to roll off torpedos, the boats could carry additional weight in arms. 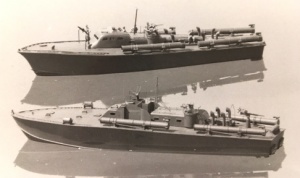 By the end of the war, both ELCO and Higgins boats were supplied with 4 torpedoes in roll off racks, two twin 50 caliber machine guns in two turrets, one 40 mm Bofors cannon on the after deck, one 37 mm cannon and one 20 mm cannon on the fore deck and two rocket launchers holding eight 5″ rockets on the foredeck. 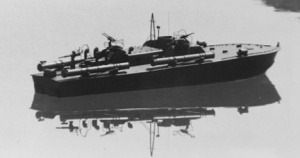 In the field, crews often added additional machine guns mounted along the sides, mortars on the top of the cabin, and sometimes swapped out torpedoes for depth charges. None of these heavily armed boats saw action before the war ended. This is a photo of the deck for the late version of the 80 foot ELCO PT. 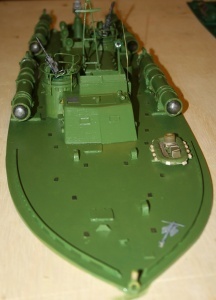 The foredeck holds the 37 mm and 20 mm cannons and ammunition boxes for the magazines for those cannon, as well as two 5″ rocket launchers just outboard of the cabin. Ventilators are enhanced and enlarged on the foredeck and the windows at the front of the cabin are modified as ventilators and windows that will not show light during night operations. Most PT action occurred at night. This boat also has the type of radar available by the end of the war. Another view of the late 80 foot ELCO. This boat carries the standard life raft atop the cabin, and has a small dingy on the engine room cabin for operating on shore. The forward torpedo racks are empty. The ammo boxes beside the engine room hold additional ammunition for the 50 caliber machine guns.